Medium - $48.99 Only 1 left! Large - $48.99 Only 3 left! In the world of pretend people have super powers. Some can shoot lasers from their eyes, others have the power to move things with their minds. And, even others can morph into some crazy things. Well, let me tell you. Once there was a man who badly wanted to be a super hero. He had a power. Some say it wasn't a power that did anything. However, he still had a special ability. It was to turn blue. Not to become sad, or completely depressed (that is far from the case he was a happy man). His power was to turn his whole body blue at any moment. Sure, this didn't help him much in his day-to-day life. But, on occasion if he saw someone he didn't like he would turn his power on. "Blue me" he said, and the blue would just cover him. He never figured out how to use this for good. But, it was a really cool party trick. 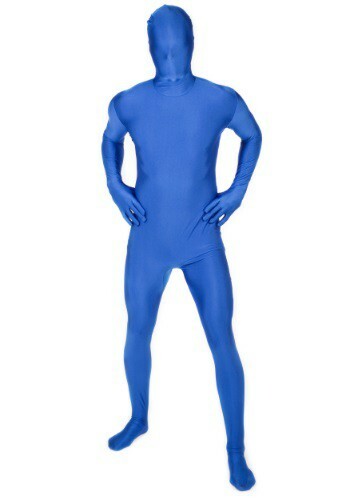 You can be like him in the Adult Blue Morphsuit. Great for a Blue Man Group costume, dressing as a Smurf, or your own creation. The Adult Blue Morphsuit is 91 percent polyester, 9 percent spandex, and all the rest awesome! It fastens in the back with a two-way zipper. The head, hands, and feet are fully enclosed. The hood, however can be pulled down for eating, or to see. Have fun getting you blue superhero on!